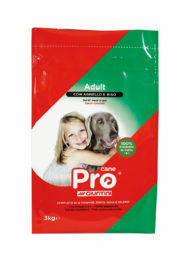 To minimise the risk of intolerances that may arise from the feeding of single protein sources, Pro Junior has been carefully formulated to provide multi-source proteins that promote gentle digestion, from both meat and vegetable sources (fish, chicken, lamb, turkey, beef, potato protein, maize gluten, soya bean seeds and yeast). A careful balance of Omega 3 and Omega 6 oils is fulfilled by the incorporation of whole flaxseed (Omega 3), soya bean and fish meal (Omega 6). Optimal vitamin and mineral supplementation has been carefully targeted at this important growth stage. 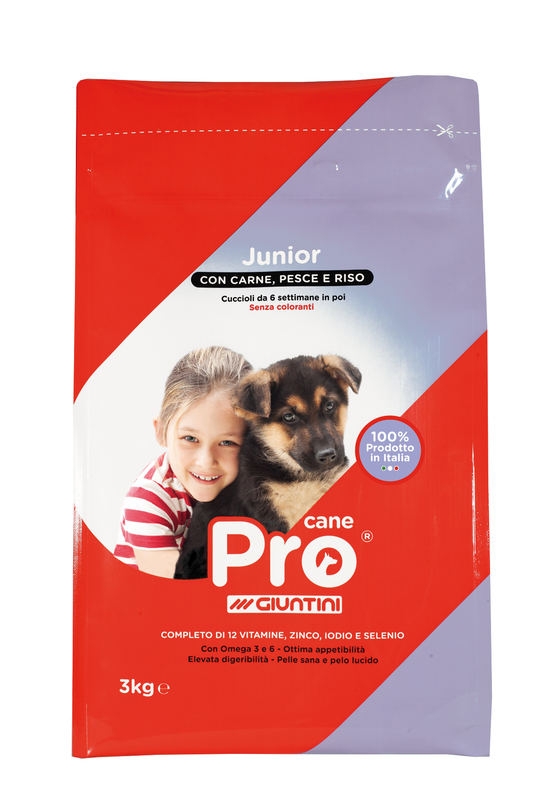 Pro Cane Junior with meat, fish and rice at will! Dehydrated animal protein (Chicken, Turkey, Beef, Lamb: min. 23%), Corn, Rice (min. 10%), Wheat, Wheat middlings, Chicken fat, Whole soya beans, Fish meal (min. 4%), Soybean meal, Hydrolyzed animal protein, Dried yeast, Potato proteins (min. 1%), Corn gluten meal (min. 1%), Whole linseed (min. 1%), Olive Oil, Tomato extract, Sodium bicarbonate, Dried garlic, Rosemary oil, Oregano Oil. Crude protein: 29,0 %; Crude oils and fats: 14,7 %; Crude fibres: 2,2 %; Crude ash: 8,0 %; Calcium: 1,5 %; Phosphorus: 1,0 %; Sodium: 0,28 %; Lysine: 1,6%; Methionine: 0,5%; Fatty acids: (Omega 3: min. 0,5% - Omega 6: min. 3,6%). Vitamin A: 25.000 I.U./kg; Vitamin D3: 1.300 I.U./kg; Vitamin E: 200 mg/kg; Vitamin C: 130 mg/kg; Vitamin B1: 7 mg/kg; Vitamin B2: 7 mg/kg; Vitamin B6: 5 mg/kg; Vitamin B12: 0,1 mg/kg; Vitamin H Biotine: 0,16 mg/kg; Vitamin PP: 30 mg/kg; D-Pantothenic acid: 10 mg/kg; Folic acid: 1,6 mg/kg; E1 Iron: 70 mg/kg; E2 Iodine: 1,8 mg/kg; E4 Copper: 15mg/kg; E5 Manganese: 70mg/kg; E6 Zinc: 75mg/kg; E8 Selenium: 0,1 mg/kg. 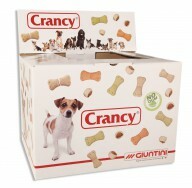 All dogs need to chew dry snack to help them have strong, healthy teeth. At the end of a run or after exercise Crancy biscuits and pillows are the correct reward for your dog.